Uglyworld #278 - The King Of Snow and Ice (7/365), originally uploaded by www.bazpics.com. After news of Ice-Bat's heroic rescue of Wage spread amongst the ugly community he's become somewhat of a local superstar, with people wanting to say hello to him, give him a hug, shake his wing and he's even had some underwear thrown at him too (which embarassed him quite a lot if I'm being honest). He was asked to do an interview for the Ugly Times in which they wanted to ask him all about himself, his life, his aspirations and re-enact the story of saving Wage from the armpit-high snow he was stuck in. As part of the feature they asked for him to meet with the papers local photographer and do a shoot, which he turned down and said, "I will only do a photoshoot when I choose the photographer". 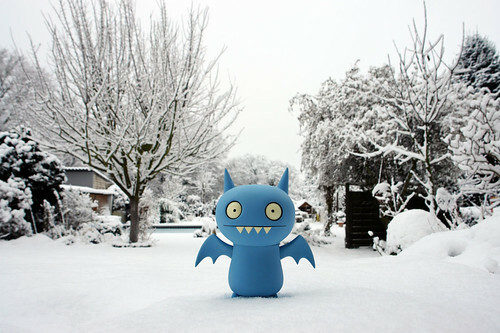 Ice-Bat is so happy with the shot and has already asked for them to run with the headline "The King of Snow and Ice".